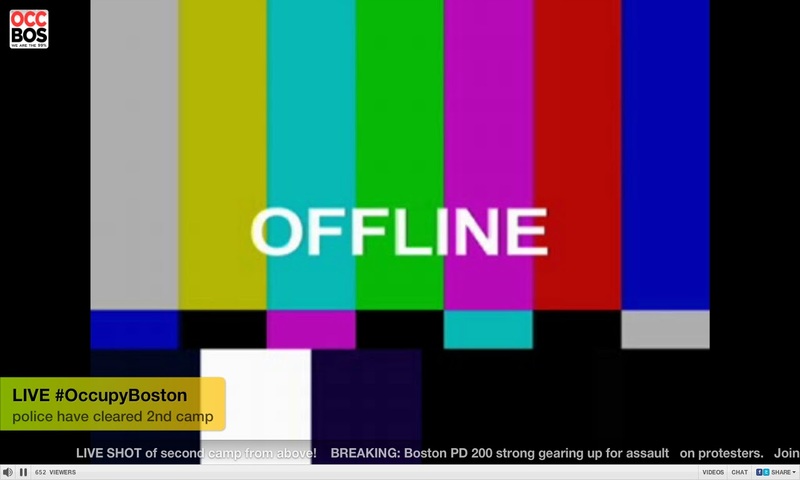 Occupied Boston Live is currently offline, but there is a message at the bottom. Boston police moved in and began arresting scores of Occupy Boston protesters who refused to leave a large part of the Rose Fitzgerald Kennedy Greenway early this morning. At 1:20 a.m., the first riot police officers lined up on Atlantic Avenue. Minutes later, dozens of sheriff vans and police wagons arrived and over 200 officers in uniforms and riot gear surrounded the Greenway. Police Superintendent William Evans and Commissioner Edward F. Davis watched from across the street. Evans gave the crowd two minutes to disperse from the park, warning that they would be locked up if they did not comply. About 10 minutes later, the first officers entered the park and surrounded the group. Evans, using a loudspeaker, gave one more warning and then each protester was individually put on his or her stomach, cable-tied, and dragged off as others tore down tents and arrested and detained people on the fringe of the park. About 100 people were arrested, Davis said. One police officer was hit in the face. The former vice president reached out to Olbermann less than 24 hours after he stepped down from MSNBC. Less than 24 hours after Keith Olbermann anchored his last edition of Countdown on Jan. 21, Al Gore placed a call to his friend inviting him to join Current TV. “We’ve been friends for a while,” Gore told The Hollywood Reporter during a press breakfast in New York on Wednesday. A contract was quickly hammered out. But it was Gore who convinced Olbermann to join the network, say sources. The former vice president and co-founder of Current was a fan of Countdown where he had also been a guest in the past. RELATED: Tim Goodman’s analysis of the move. Olbermann’s Current show will likely premiere in late May, when the non-compete clause in his exit agreement with NBC Universal will have reached its conclusion. Sources tell THR that that agreement also stipulates that Olbermann cannot work for any network considered a competitor. “He had no choice but to go to a place like Current because his non-compete excluded just about every other place,” said an MSNBC insider. Current averaged 18,000 homes in primetime for fourth quarter 2010, lower than any other network measured by Nielsen. 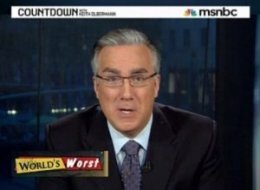 WASHINGTON – Liberal former MSNBC star Keith Olbermann is reportedly taking his talents to Current TV, the channel led by former Vice President Al Gore and businessman Joel Hyatt. Olbermann’s spokespersons and Current TV executives declined to comment to the Times but didn’t deny that a deal was pending. 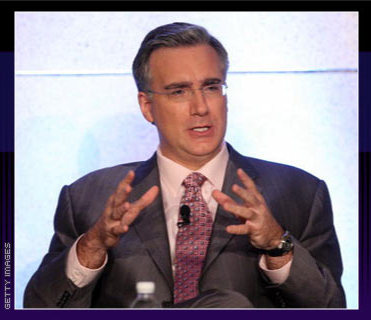 One source told the paper that Olbermann would have equity stake in Current TV. Olbermann’s public relations firm said in a press release he would make the announcement regarding his next move on Tuesday in a private news conference. 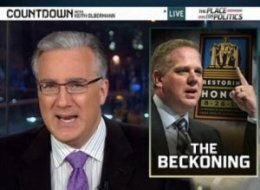 Keith Olbermann claimed he was worried about Glenn Beck’s sanity after Beck said that he wanted to let “the spirit” speak through him at his “Restoring Honor” rally at the Lincoln Memorial this Saturday. BECK: I’m only writing a few bullet points. And I am doing that so I don’t get in the way of the spirit, in case he wants to talk…if you would just pray that I would be able to hear because sometimes–sometimes he’s screaming at me and I still can’t hear it.